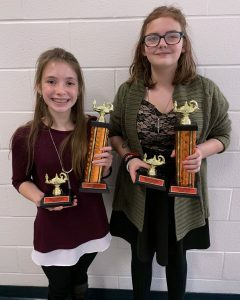 Speech teams from The Linsly School, Moundsville Middle School, Sherrard Middle School and Van Devender Middle School competed Saturday in the annual Moundsville Middle School Forensics Tournament. More than 60 students competed in 10 different categories including Prose, Poetry, Sales, Broadcasting and Duo. Each participant presented the same piece three times throughout the day. Local educators and community members served as judges. Trophies were given to the top six places in each event. The Sweeps Award was presented to the winning team, Moundsville Middle School. Sherrard Middle School captured second place, by one point, over the The Linsly School who placed third. Van Devender Middle School finished fourth. 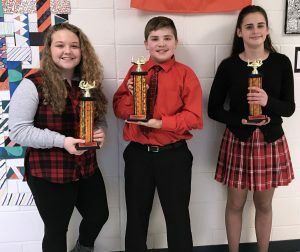 The Trojans have participated in middle school forensics for nearly a decade. MMS students practice throughout the school year, meeting weekly with adult coaches and advisors, though most work is completed independently. The MMS team has experienced continued growth every year since its first season. The group is advised by Charlotte Nadolski, the team’s founder. Pictured from left: MMS 1st place finishers Khloe Trussell, Raymond Steed and Bailey Sebroski. Pictured from left: SMS 1st place finishers Maria Evans and Emilee Doty.